As some of you may already know, sadly, funding has now come to an end for our DIG FOR LIFE project worker, Lauren Kinnersley. 2011 was a fabulous year in terms of what we were able to achieve at the allotment in encouraging more groups to visit the site and become involved. This has been largely a result of successful funding bids, the efforts of Lauren, combined with valued support and enthusiasm from the Dig In volunteers. We still hope to continue working with Lauren in some capacity in the future as funding permits and on behalf of the volunteers, management committee and everyone connected with the Dig In project, wish her every success for the future. We will certainly miss you Lauren. Although project funding may be more limited this year, we are determined to continue our success in involving and encouraging more of the local community to encompass a healthier lifestyle, using whatever resources are available. We are still going forward with our plans for a composting toilet on the site, and we are currently creating a raised bed area to provide a safe growing space for children accompanied by a childminder group. Steptoe and Son meet the Dig In storage container, or otherwise known as the annual Dig In stock take and tidy up. Several hardy Dig In volunteers braved the cold weather on Saturday and made a terrific job of tidying the storage unit and removing several large bags of accumulated rubbish. We can now actually see some of the floor. 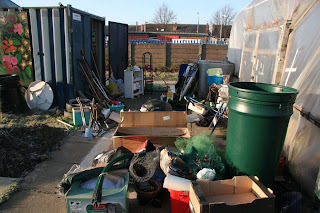 We didn't have time to clean the polytunnel, but that will be the next task on the Spring cleaning list. Chris Davis took this photo to mark the event. Happy new year- the start of another growing season is upon us but before we embark, let’s have a recap on 2011. A very successful year in the amount and variety of produce grown but more importantly, DIG IN has reached out to many local local families, adults and children and local groups. Pulp Friction took over the fruit beds and with the fantastic commitment from the Swain family, they developed the wilderness into a wonderful productive and creative space. Our memorial tree to Chris, who’s passing left a sadness to the year, was planted in November and stands in the orchard. Thanks to all the volunteers who have worked tirelessly to make DIG IN’s success ongoing. Thanks to Lauren- the DIG FOR LIFE project worker, who has worked above and beyond expectations. Thanks for everyone who has supported us and been involved or attended events, cook and eats or workshops at the site. Apple and Pumpkin day alone drew in over 250 local families. Thanks for the ongoing support shown by Stapleford Town Council. 2011 saw the very first DIG IN wins at the Stapleford and district allotments show in August. We hope to expand on the comedy veg and grapes in 2012! A complete report on the activities of 2011 will be available at the DIG IN AGM in May 2012.More details will be posted on the website and blog nearer the date. DIG IN can only be as good as the people in it. More volunteers are needed to be part of the decision making and running of DIG IN, to work on site at the sessions and be part of the management committee. We need your help to plan and run the events and workshops and we need your ideas to keep DIG IN part of the local community of Stapleford. The demands on your time can be as minimal as you want but the rewards are huge. If you are interested in sharing your skills and ideas, or interested in developing new skills (writing press releases, funding bids, treasurer/ secretary skills/DIY skills/events planning etc), being involved with DIG IN may give you more than just growing experience. We are taking time over the winter to plan for site growing and the activities for 2012, so if you have any ideas you think will work well at DIG IN please let us know. In 2012, we will continue with our growing activities on site, funding permitting we will hold events open to the public and run workshops to encourage an interest and knowledge in a variety of food and environmental interests. We aim to secure funding for worker time which will enable groups to have support for onsite growing sessions. We aim to reach more local people and spread the word about how fantastic it is to grow your own veggies. Happy New Growing Year to all from DIG IN.